Karthi is to marry erode based ranjani on July 3rd 2011. Karthi a Masters degree student made his debuntant in tamil film industry via mega buster paruthiveeran. Siruthai, naan magaan alla are some of his notable success. 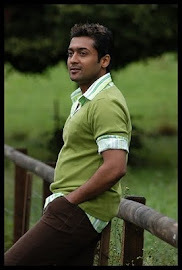 He is casting role in saguni in which he does a politician. Joythika has advised karthi to give gift to wife on a frequent basis. To give surprise gifts is the key to good relationship as per jothika.